Never Enough Nails: OPI Hawaii Spring/Summer 2015 Swatches- Hulas, Geckos and Waves! 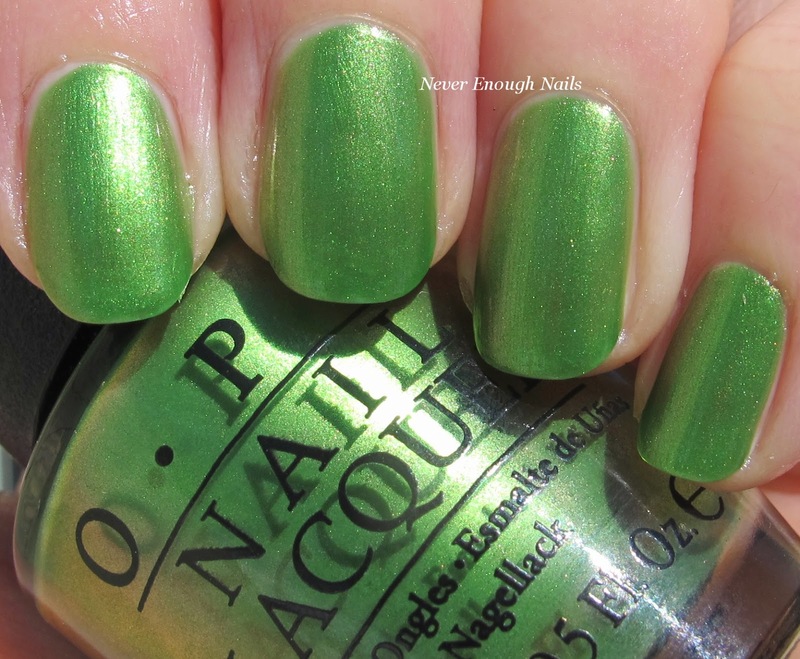 OPI Hawaii Spring/Summer 2015 Swatches- Hulas, Geckos and Waves! Today I have the last 3 polishes from the OPI Hawaii collection to show you. I don't have any fun nail art in this post, due to time constraints (a.k.a. St. Patrick's Day events), but I do have plans for something pretty using one of the polishes. First up we have the adorably named OPI My Gecko Does Tricks. I think geckos are so cute and I would love one for a pet, so I love this name! 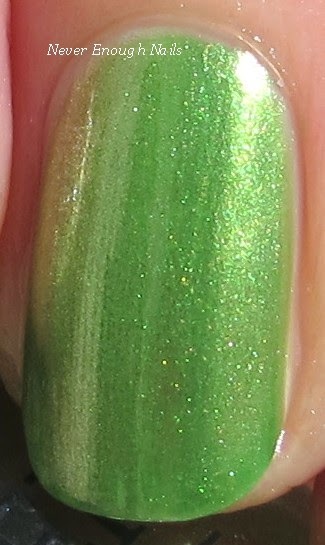 My Gecko Does Tricks is a pretty light grass green shimmer. After a long winter, this color feels really fresh and spring-y. The shimmer is really lovely, it's sort of golden in some lights, but it doesn't make the polish feel too warm toned overall. This is going to be great for St. Patrick's Day manis! This is two easy coats of My Gecko Does Tricks. I thought the formula was great, so easy to apply and control. You can see some brushstrokes in the pictures, but my naked eye didn't notice them at all. Sometime the camera lens is a little too picky! 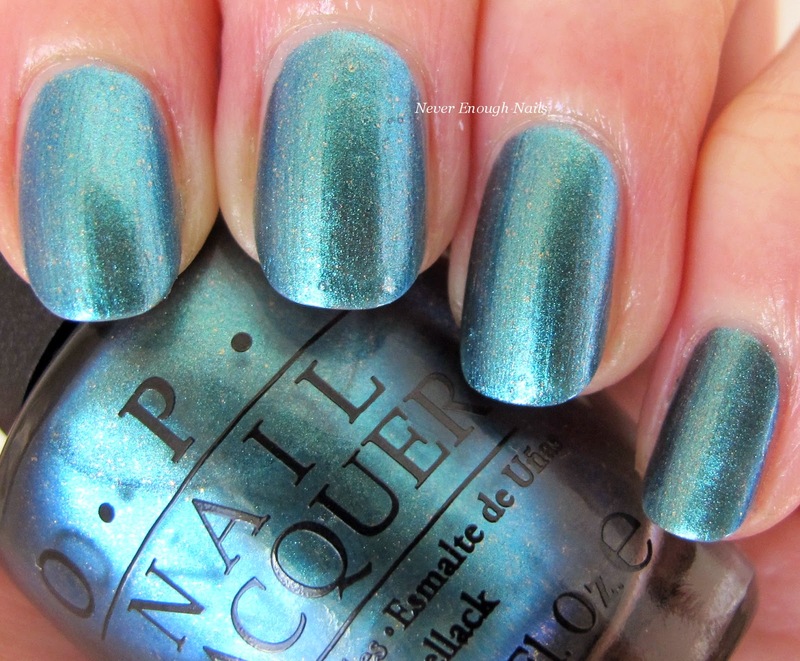 OPI This Color's Making Waves is a pretty blue metallic shimmer with a twist. The twist is hard to see in photos, but you can see it in person and in the bottle. There are gorgeous pinky copper flecks of shimmer mixed in with the blue! These flecks make this blue metallic stand out from others we have seen in the past. I did three thin coats of This Color's Making Waves, but two medium-thick coats would probably work well too. This was easy to apply and had a great formula! I think you can see the copper flecks in this picture below if you look closely. They are so cool looking in person! 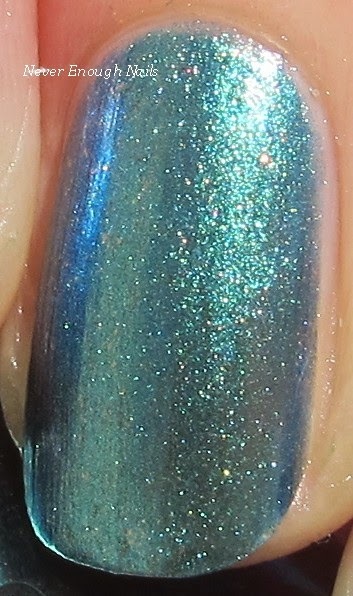 Last, but DEFINITELY not least, is my personal favorite of the collection, OPI That's Hula-rious!. This is the palest fresh mint green creme and I love how much white is mixed in here. It gives it that stark, kind of mod look. I have definitely been waiting for a minty color like this! I can't get enough mints during spring. I just bought mint green Adidas LOL, it's my color for the season. I knew from the minute I saw the first picture of this that I would love it. Just by bottle comparisons (I will a do a swatch comparison eventually as well), That's Hula-rious is brighter and less dusty than China Glaze Refresh-mint and less milky, more stark/mod looking than Zoya Tiana. That's Hula-rious! has an amazing formula for a color this pale and stark. This is two coats. Just two coats! No mucking around with three or more coats, no matte top coat in between layers to prevent streaking, no fussiness whatsoever. It self-levels like a champ and needed barely any clean-up. That's Hula-rious! applies like a dream. Go With the Lava Flow, Aloha from OPI, Is Mai Tai Crooked? I love these too Ananka! But then again, I always love blues and greens! !